The Dictionnaire Infernal (English: Infernal Dictionary) is a book on demonology, describing demons organised in hierarchies. It was written by Jacques Auguste Simon Collin de Plancy and first published in 1818. There were several editions of the book; perhaps the most famous is the 1863 edition, which included sixty-nine illustrations by Louis Le Breton depicting the appearances of several of the demons. Many but not all of these images were later used in S. L. MacGregor Mathers's edition of The Lesser Key of Solomon. The book was first published in 1818 and then divided into two volumes, with six reprints—and many changes—between 1818 and 1863. This book attempts to provide an account of all the knowledge concerning superstitions and demonology. Anecdotes of the nineteenth century or stories, recent anecdotes, features and little known words, singular adventures, various quotations, compilations and curious pieces, to be used for the history of the customs and the mind of the century in which we live, compared with centuries past. Infernal Dictionary, or, a Universal Library on the beings, characters, books, deeds, and causes which pertain to the manifestations and magic of trafficking with Hell; divinations, occult sciences, grimoires, marvels, errors, prejudices, traditions, folktales, the various superstitions, and generally all manner of marvellous, surprising, mysterious, and supernatural beliefs. Influenced by Voltaire, Collin de Plancy initially did not believe in superstition. For example, the book reassures its contemporaries as to the torments of Hell: "To deny that there are sorrows and rewards after death is to deny the existence of God; since God exists, it must be necessarily so. But only God could know the punishments meted out to the guilty, or the place that holds them. All the catalogues made herebefore are only the fruit of a more or less disordered imagination. Theologians should leave to the poets the depiction of Hell, and not themselves seek to frighten minds with hideous paintings and appalling books" (p. 164). The skepticism of Collin de Plancy increasingly subsided over time. By the end of 1830 he was an enthusiastic Roman Catholic, to the consternation of his former admirers. In later years, De Plancy rejected and modified his past works, thoroughly revising his Dictionnaire Infernal to conform with Roman Catholic theology. This influence is most clearly seen in the sixth and final 1863 edition of the book, which is decorated with many engravings and seeks to affirm the existence of the demons. 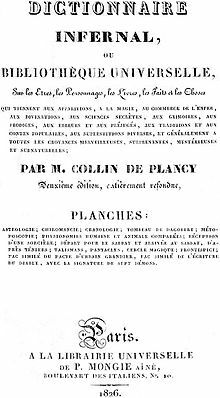 de Plancy collaborated with Jacques Paul Migne, a French priest, to complete a Dictionary of the occult sciences or theological Encyclopaedia, which is described as an authentic Roman Catholic work. Many articles written in the Dictionnaire Infernal illustrate the author's vacillation between rationalism, faith, and willingness to believe without evidence. For example, he admits the possible effectiveness of chiromancy, while rejecting cartomancy: "It is certain that chiromancy, and especially physiognomy, have at least some plausibility: they draw their predictions from signs which relate to features which distinguish and characterize people; of lines which the subjects carry with themselves, which are the work of nature, and that someone can believe significant, since they are unique to each individual. But the cards, merely human artifacts, not knowing either the future, nor the present, nor the past, have nothing of the individuality of the person consulting them. For a thousand different people they will have the same result; and consulted twenty times about the same subject, they will produce twenty contradictory productions" (p. 82). ^ Michelle Belanger (8 October 2010). The Dictionary of Demons: Names of the Damned. Llewellyn Worldwide. p. 109. ISBN 978-0-7387-2745-5. ^ Dictionnaire infernal: répertoire universel des êtres, des personnages, des livres, des faits et des choses qui tiennent aux esprits ... H. Plon. 1863. p. 11. ^ a b "XLII/KWS 37/Dictionnaire infernal". Quarante-deux.org. 2012-04-25. Retrieved 2012-06-19. ^ "Dictionnaire infernal – Chroniques Livre". La Horde Noire. Retrieved 2012-06-19. ^ "Exorcisme catholique". Atheisme.free.fr. Retrieved 2012-06-19. ^ de Plancy, J Collin (2015). Infernal Dictionary Deluxe Edition. Abracax House. p. 764. ISBN 0997074515. Wikimedia Commons has media related to Dictionnaire Infernal. Dictionnaire infernal: ou Répertoire universel des êtres, des personnages, 1863 PDF download available.